Reviewed by Chris Arnsby. David "Kid" Jensen: "And a warm welcome to another forty minutes of hit sounds in vision. And we begin this week's music and lights with this from Imagination." Irene Cara: Fame: Gosh, BBC4 have stumped up for the official promo which is the relevant clip from the film; probably (I haven't seen it). Grease, Watership Down, Xanadu, and Paradise all fell victim to budget conscious BBC4's scissors but Fame got through. Presumably this is the original presentation so the clip starts with a credit "FAME courtesy of MGM and ends with the standard singer/song credit. I hope the shots of massed dancers filling the street and all doing their own thing are how Zoo looked in Flick Colby's imagination. 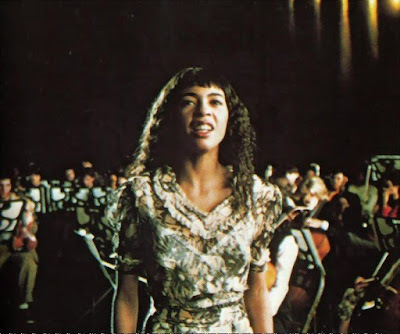 Irene Cara moments before she did in fact learn how to fly. Shalamar: A Night To Remember. "A couple of weeks ago Jeffrey Daniel from Shalamar danced his way onto the programme, and we've had hundreds of letters from people asking for him back. Well he is back moving to his music, A Night To Remember." It's worth tracking down the original performance on Youtube because it was skipped from the BBC4 run (D*v* L** Tr*v*s). It's notable how the Vision Mixer slows down the speed of the shots for both performances. 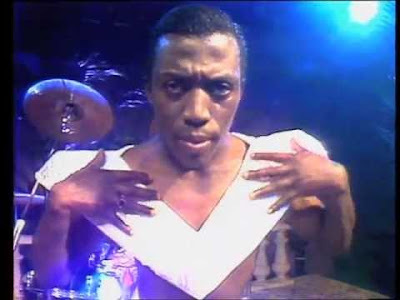 Compared to the pacing of a normal Top of the Pops routine the presentation is glacial -the first camera shot of this routine is held for 45 seconds before cutting- but it allows Jeffrey Daniel's astonishing dancing to speak for itself. Keep an eye on the rostrum behind the circular backcloth. On the line "I'm so glad we reached an understanding," a portly, balding member of the production team starts to walk behind the backcloth. He pauses, as he realises he about to walk through the back of the shot, and then raises his hands to his shoulders, wiggles his hips, and then walks across to the other side. AC/DC: For Those About To Rock (We Salute You). "And by way of a contrast now..." David "Kid" Jensen does one of those awkward presentational gear changes that used to blight That's Life when it had to change from a story about sad kittens having a hard time to an amusing misprint from the Oswestry Clarion & Bugle. I would have gone from Shalamar straight into the US chart round-up which has been snipped from this edition (J******** K***) to avoid the tonal shift from Jeffrey Daniel to blurry concert footage of AC/DC. Trio: Da Da Da. The audience have been asked to hold up self-portraits -probably a reference to the single's cover- and it gives the studio a sinister air. Wikipedia tells me that Trio liked to call their style of music New German Cheerfulness. "Why wasn't that the German Eurovision entry?" asks David "Kid" Jensen in a dig at either Nicole or Trio; it's not clear which. Come on "Kid" let's not be a sore loser. Odyssey: Inside Out. I'd be willing to bet real money that this was a repeat from an earlier edition of Top of the Pops. The picture quality seems slightly worse and the contrast is a little murkier, as if there was a loss of resolution caused by copying from one tape to another. However, I would lose money on that bet because this is the only time Odyssey appear in studio to perform this song. The appearance of poor picture quality might come from the vast quantities of smoke being blown around in the studio. Bananarama: Shy Boy. And here's another performance which could have been dropped in from an earlier programme. Bananarama are lit in vile purple tones. A style I've come to associate with the magenta monster Fred Wright who bathed the Top of the Pops studio in unnatural slabs of neon colour between April and May 1982. However Lighting this week is the responsibility of John Dixon so maybe Fred Wright was just egging him on. Bucks Fizz: Now Those Days Are Gone. Bucks Fizz have a stab at being a serious group rather than fun Abba-light fluff. Your mileage may vary but Bucks Fizz are not my go to group if l want to listen to a serious slow-harmony a cappella song which reflects wistfully on the easy nostalgia of times passed. 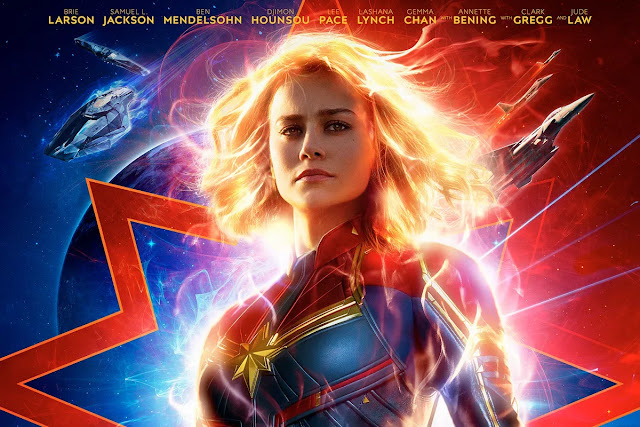 In the promo film you never see the two blokes from Bucks Fizz together. Have they had a row? Captain Sensible: Happy Talk. Psychedelic frights aplenty. Captain Sensible is dressed as a colourful scarecrow -with optional moth-eaten parrot- while the three backing singers are done up as rabbits in the style of that kid who used to sing Bright Eyes on TISWAS. They all dance on a stage decorated with tinsel, balloons, and hippy flowers. Overhead a seagull fresh from The Island Of Doctor Moreau, and via Frankenstein's laboratory, jerks it's wings up and down. It's one owl short of a Hieronymus Bosch painting. 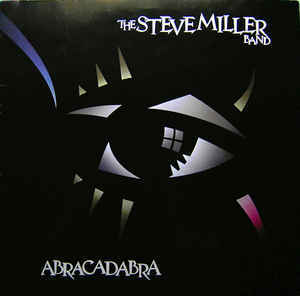 Steve Miller Band: Abracadabra. The show plays out by cutting between the Abracadabra video, the crowd dancing, and real live magicians doing real live magic. One of the tricks involves producing numerous rabbits out of boxes; the Top of the Pops studio floor seems like a dangerous place for rabbits with all those cameras wheeling around. There's also a juggler unwisely juggling with flame on the Captain Sensible stage. I hope that tinsel is fireproof. Ronnie Hazlehurst is still being credited as Musical Director and a Mike Leggo is listed as Production Manager. Presumably that's the later Producer of Noel's House Party rather than as Wikipedia insists a retired National Hockey League referee from North Bay, Ontario.